What is intrathecal baclofen therapy, and how does it fit into the spectrum of spasticity management options for individuals with spinal cord injury? In this SCI Forum, Rina Reyes, MD, Medical Director, UW Medicine SCI Rehabilitation Program and Assistant Professor, UW Department of Rehabilitation Medicine, provided in-depth information about when to consider an implanted, programmable baclofen pump for spasticity management; the process of being evaluated for this treatment; the potential advantages, limitations, and drawbacks to the pump; and requirements to maintain a baclofen pump. In addition, a panel of individuals (two with spinal cord injury and one with MS) who have implanted baclofen pumps discussed their reasons for choosing the device and what the experience has been like for them. 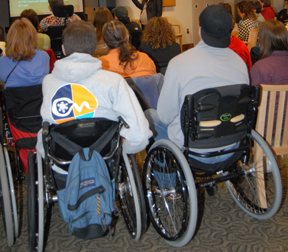 Presented on January 12, 2010 at the University of Washington Medical Center. Read the report or watch the video on this page. Presentation time: 85 minutes. After watching, please complete our two-minute survey. Thank you! What is the intrathecal baclofen pump? What does it take to maintain the pump? When is intrathecal baclofen a good option? Spasticity is the uncontrolled reflex-type contraction (tightening) of the muscles that occurs in individuals who have had an injury to the brain or spinal cord. The contractions can cause involuntary jerking and difficulty relaxing, coordinating or controlling movement. Spasticity is often triggered by ordinary activities such as stretching, changing positions, or even just a touch. The symptoms and severity of spasticity vary widely from person to person, even with the same type or level of injury. Spasticity can have beneficial or negative effects on function; sometimes the effects are a mixture of both. Benefits include increased or preserved muscle tone, improved circulation, and even enabling you to stand, transfer or empty your bladder. On the other hand, spasms can be painful or so strong that they interfere with transfers, seating, sleeping, or performing daily activities. Is it causing me more problems than benefits? Will reducing my spasticity lead to an improvement in my ability to do things? Significantly interfering with voluntary movement. Difficulty maintaining range of motion or position. Contributing to pain or skin breakdown. Making personal care difficult for you or your caregiver. Spasticity occurs in up to 78% of people with SCI, and 49% or more require treatment of some kind. Stretching or range of motion, weight-bearing. Positioning, splints (orthotics) or braces, taping. Electrical or vibratory stimulation to the opposing muscle to attempt to relax the spastic muscle. Serial or inhibitory casting – a process of repeatedly and progressively casting a limb closer to the desired position in order to “reset” muscle stretch reflexes and lengthen muscles/tendons. The advantage to these non-pharmacologic measures is that they have minimal side effects and can be used in addition to medications. These work well in reducing spasticity for some people, but not for others. For some, these measures are not sufficient to control the muscle tightness or spasms to the extent they desire. Sometimes nerve blocks or injections of anesthetics, alcohol or phenol, or neurotoxins such as botulinum toxin (Botox, Myobloc, Dysport) are used if spasticity that requires treatment is limited to one or a small area of the body. People with SCI usually have more extensive spasticity, however, so oral medications are often needed. Examples of these medications include baclofen, tizanidine, clonidine, benzodiazepines such as diazepam or clonazipam, gabapentin and dantrolene. Since the medications affect the whole body you may get unwanted side effects such as sedation (sleepiness) and fatigue. You may need several doses daily. Concentration in your system varies according to how recently you took your last dose, and this may cause peaks and valleys in spasticity control. You may need periodic blood monitoring for some of these drugs that can have potential side effects on liver function or blood counts. Some can interact with other medications. What is the distribution of spasticity in your body? How reversible do you want the treatment strategy to be? What other health conditions do you have that could be affected by your treatment choice? The direct infusion into the intrathecal space minimizes the amount of drug needed to be effective. Limits or eliminates the common undesirable side effects associated with taking oral medications for spasticity. It can deliver a precise and consistent drug dose throughout the day, so you avoid the peaks and valleys of taking oral medication. Dosing is very flexible and can be programmed any way you need it, from the same dose administered on an hourly basis 24 hours a day, to different doses at different times of the day or days of the week. Pump — a metal canister containing the battery, the programmable component that stores information, and the drug reservoir. The pump is surgically implanted under skin in the lower abdomen on either the right or the left side. Catheter — connected to the pump, it runs under the skin and enters the spinal canal in the low back. The tip of the catheter is placed into the intrathecal space and advanced higher to a predetermined location, depending on how much spasticity you have in your arms, your trunk, and your legs. Programmer — an external handheld system used by your provider to read the pump information and reprogram pump using radiotelemetry. Medication is instilled into the reservoir inside the pump. Inert gas inside the pump creates pressure on the expandable reservoir, pushing medication into the internal tubing. Battery-powered microprocessor controls the flow rate by operating the rotor, which drives the medication through the tubing into the catheter. Medication flows slowly through the catheter into the spinal fluid. What does it take to maintain a pump? You must visit your physician or pump manager regularly to have the pump refilled with baclofen before it runs out. The frequency of the refills will depend on which drug concentration is used, the daily dose that's required and the pump size. It's similar to gas your car. You can only have so much in the system, so it needs to be refilled periodically; and how often it needs to be refilled just depends on your use. There are two pump sizes, a 20 ML and a 40 ML. We encourage the larger size if possible so you won’t need to refill it as frequently. Your provider should help with considering which size is likely to work best for you. FDA regulations require that you get the pump refilled at least every six months, even if your pump is not yet empty. Refill frequency varies between 1 and 6 months. You may need to get the dose or pattern of infusion adjusted periodically, especially when you first start with the pump. When a pump is newly placed, some people find the ideal dose quickly, but many will take several weeks or months to find the right dose and infusion pattern. This process is usually very quick and involves “interrogating” or analyzing the pump using the handheld programmer. If there's been any trauma to the pump site and you're concerned about whether the pump is working correctly. If you have an MRI, make sure you have an appointment to have your pump checked within two hours after to make sure the pump rotor has restarted itself after an expected stall because of the magnetic effect on the rotor. If the pump alarm goes off. After about 5 to 7 years, your pump will need to be replaced with another surgery. Unless there is a problem with the catheter system, the catheter will not require replacement, and the section near the pump will be simply reconnected to the new pump. When is intrathecal baclofen therapy a good option? When you have insufficient spasticity control using other options. When there are unacceptable side effects to oral medications. If you need a more precise dosing system to deal with fluctuations in your spasticity. Intrathecal baclofen is generally very effective at reducing spasticity in the spinal cord injured population. Furthermore, this method has also provided additional benefits, including decreases in pain, bladder hyperactivity and time required for caregiving. The system needs to be replaced about every 5 to 7 years. This time only the pump is replaced, so the surgery is less complicated than the first time. As with any surgery, there are potential surgical complications (bleeding, infection). It is far more expensive than using oral medications, although it may save money in the long run. There are potential complications related to the pump or catheter system or due to human programming errors. To reduce these rists, the user must have a good understanding of the warning signs of baclofen overdose and underdose, the ability to monitor these warning signs, good transportation in an emergency, and be vigilant in coming to scheduled refill appointments. Works best for treating leg spasticity rather than arm, hand, or upper trunk spasticity. Since spasticity can help people with standing, walking or transferring, taking away the muscle tone caused by your spasticity may reveal that you are weaker than you thought, and you might even lose some function if this occurs. Unfortunately, there is no way of knowing ahead of time if this might happen. 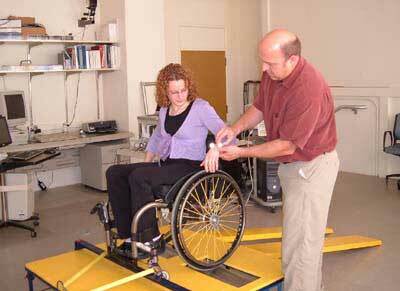 A good rehabilitation or therapy assessment may help you think about how spasticity reduction may affect you. Are your goals realistic? The number 1 source of dissatisfaction with this therapy is having unrealistic goals for what intrathecal baclofen can do for you. Your provider has determined that you can benefit from intrathecal baclofen and that it is physically safe for you. Ideally, you have had a multidisciplinary assessment that includes nurses and therapists in addition to the rehab provider. Consider travel time and access to care for regular maintenance and refills, as well as possible emergencies. Insurance coverage—what will it pay for? To determine if your spasticity will respond to intrathecal baclofen, you will receive a single injection of 50 micrograms of liquid baclofen into the intrathecal space of your lumbar spine, similar to a spinal tap. Your spasticity will be tested, preferably using functional assessments and not just moving your legs and arms around. 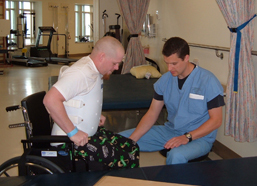 At the University of Washington, PTs and OTs work with patients prior to the injection and between 2 and 4 hours post injection to test spasticity and functional changes. If you respond successfully to the screening trial, you are ready for the next step. If you do not get an adequate response to 50 micrograms, you can be tested with 75 or 100 micrograms at a later date. If you don’t respond at 100 micrograms, intrathecal baclofen is probably not going to be a successful treatment for you. Location: Typically the pump goes in the lower abdomen on either the right or the left side. Exact location will depend on factors such as whether you have sensitivity in certain areas of the abdomen, where your belt or other clothing will lay against your skin, whether you have any ostomies, and details about your seating position. 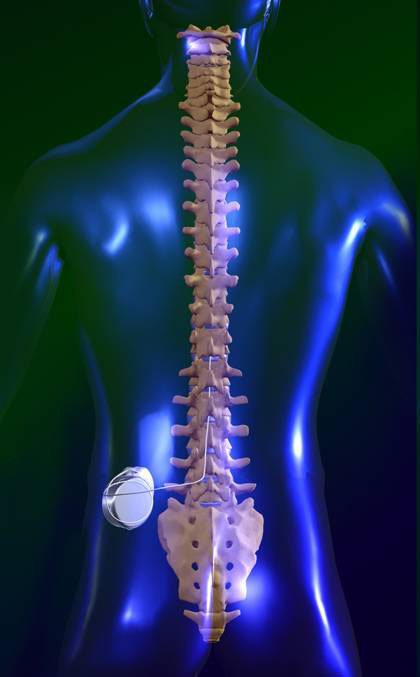 Implantation: The catheter is inserted into the spine in the lower back, through the bones of the spinal canal and threaded into the intrathecal space. The other end of the catheter is threaded underneath the skin to the pump, which is placed under the skin of the lower abdomen. Dosing: The initial dose is programmed at the time of the implantation and adjusted over your hospital stay as needed. Dosing varies enormously from person to person and is not related to level of injury or body size. It may take up to several months of little adjustments before achieving the correct dose. Make sure you continue taking your oral medications even after the pump is implanted and to wean off of them gradually with guidance from your provider. Classic symptoms of baclofen withdrawal are a sudden increase or return of your spasticity or tone, profuse sweating, and itching without an associated rash. You can also have fever, high heart or respiratory rate, high or low blood pressure or even confusion. Severe withdrawal symptoms include hallucinations or delirium, seizures, rhabdomyolysis (where you actually start to breakdown muscle), organ failure and even death. Know the signs of baclofen withdrawal and contact your provider right away even with mild withdrawal symptoms to avoid progressing to severe withdrawal. Causes of withdrawal include the pump running empty; programming error; incorrect baclofen concentration; a problem with the catheter system; and a problem with the battery. Some of these problems will activate the alarm. Treatment for withdrawal is to resume baclofen infusion (or oral medication as a substitute) as soon as possible. If you find yourself in an emergency room and need something urgently, IV diazepam is a good option. Keep and follow a plan for all refill appointments that creates a little leeway to make sure you don’t run empty, especially if you have a long way to travel. Make sure you know what the alarms sound like and what they mean. Contact your pump provider as soon as you notice an alarm, any withdrawal symptoms, or suspect a system problem of any type. Plan to see your provider after you have an MRI to make sure that the motor stall has recovered. Keep a supply of oral baclofen or other anti spasticity medication with you at all times in the event that you have a withdrawal reaction. This is far less common than withdrawal. Mild symptoms include low muscle tone and difficulty concentrating, sleepiness or lightheadedness. Moderate symptoms are slowed heart rate, respiratory depression (slowed breathing), difficulty awakening or staying alert. Severe symptoms are low muscle tone spreading to trunk, arms, face and neck; stupor/coma; seizures; severely slowed breathing that needs mechanical ventilation, and death. Possible causes of overdose are human error in dosing, programming or filling the pump; system malfunction; or unsafe combination of intrathecal and oral medications. Most of the time, mild overdose symptoms can be easily managed by turning the pump rate of infusion down. Scuba diving or anything that changes the pump's pressure or temperature in and around the pump, including ultrasound directly over the pump site, sauna or hot tub. Your next alarm date. Each time your pump is refilled you will learn the date when your alarm will go off to signal low pump volume. You should schedule a refill appointment for about a week before that date. Signs and symptoms of withdrawal and overdose from baclofen. Whom to call if you have a pump problem (24-hour telephone contact). Getting the outcome you desire from intrathecal baclofen therapy. Know yourself and your spasticity— triggers, patterns, what seems to help, and what options you have tried in the past. You need to have clearly stated goals for spasticity reduction that include a functional improvement of some kind, such as increasing your range of motion, making personal care easier, or reducing side effects of (or the need for) oral medications. Talk to your provider to determine whether these goals can be realistically achieved with this treatment. Know the potential risks and how to respond to problems. Be realistic about your ability and motivation to participate in all maintenance requirements over the long term. Shop for a pump provider who has a lot of experience implanting and troubleshooting these systems. Make sure the management philosophy, style and availability of the pump manager is what you expect and are comfortable with.